Samuel is such a friendly guy! At the mall or in my building on campus, he will walk up to random passersby and start a conversation. Icebreakers have included: "I have a haircut," "It was my birthday, but my birthday is over now," "Grandma Benac died," and "My mom has that iPod, too! Do you have mad birdies?" For a long time, he thought that all salt and pepper haired gentlemen with glasses was Grandpa. I kept reminding him that it was probably someone's grandpa, but not ours. After that, he would excitedly point out the same type of person and say "Look! Somebody else's Grandpa!!!" His lack of fear around strangers reminds me of myself at that age..
Samuel is calculated and careful. Playing UNO with the kids, Samuel is the one who will put his cards down and pause the game in order to meticulously straighten the discard pile. How may three year olds do that? He will also sit and play Angry Birds on end and actually get good scores! He is so animated. Last week he was riding in the shopping cart playing Frogger on my iPod, and every time his frog got hit by a car (like, every 15 seconds...), he screamed and squealed. All the little old ladies were truly smitten. When we watched Toy Story 3 the second time, he, very convinced that this is all real, shouted out a warning to Buzz as he approached the questionable vending machine, "No! Don't go in there!" Everyone in the movie theater heard it and laughed. He is also very concerned and expressive. A few weeks ago we were teaching the children Lehi's dream in the Book of Mormon. They were very interested in the story and seemed to understand the symbolisms that we were explaining (this kind of attention span is very rare, trust me!). When I told them about the mists of darkness and what it would mean and how sad it would be for one of our family to be "lost" in a modern day mist of darkness, Samuel burst into tears and said "I don't want to get lost in the mist of darkness!!!" Lets hope he keeps that righteous ferver! At the mall play area last week, the kids were playing and had taken off their shoes. A few minutes later, Samuel came to us crying. We didn't see him get hurt, so were curious what was wrong. He announced "That kid took my shoes!" We looked, and sure enough, another kid playing had the same pair of Walmart shoes. We showed Samuel his own shoes sitting on the bench next to us and he was appeased. He's emotional, too. But most of that is probably being three. We are teaching him how to use words instead of emotions when something is not his way. He likes to melt down and cry or yell or hit at those moments, but he's learning that I don't tolerate it at all. We can usually nip it right away. He has definately learned that when Mom starts counting to three, he better get his booty in motion, because three means a spank. He tries to protest, but by the time I get to two, he is repentant and quick-footed. When I announce what is for lunch or dinner, he tells me if it is his favorite or not, meaning if he wants it right now or not. So for example, today it was "Spaghetti is not my favorite. Chicken nuggets feels me better." And of course tomorrow, chicken nuggets will not be his favorite. Samuel is (finally!) a big boy, and he is so proud of it! Every night at pajama time he protests a night time diaper because "Big boys don't wear diapers." And whenever I take him potty in public, he is very concerned that we have to use the girls bathroom. This week I called him "sweetie pie" and he corrected me in all seriousness with "I'm not sweetie pie, I'm big boy pie." Samuel is quite a gymnast and a daredevil. Just look at my post last month about putting up the rings in the basement. We are planning on getting him in to a gymnastics class very soon. Samuel LOVES babies! It is so cute to see him dote over some little stranger in a stroller wherever we go--we're working on learning about personal space. I think he is going to really enjoy being a big brother! Samuel plays until he is completely wiped out. 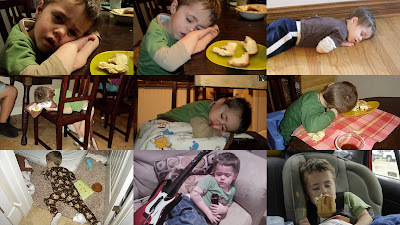 Here is some photographic evidence that by dinner-time, Samuel-who-didn't-nap will fall asleep anywhere. Assuming that we will start having nice days soon, do you think I will be able to put all five gallons of stain on the fence before having a baby? And I'm still working until the semester is over! I have six weeks left, and I would go nuts if I sat around rubbing lotion on my belly and timing contractions waiting for Baby Sister to be born, so I made a to-do list. It includes things like organizing baby clothes, fixing the mailbox, putting together a shed, painting the trim on the back door and restaining the fence, making matching summer dresses for Leah and Baby Sister, organizing and dejunking our closet...and a few more. I'm not even going to bother planning my garden until after she's born, because its been known to snow here in late May. Who knows if the garden will even happen at all this year. When I was at this point before Samuel was born, I scrubbed the couches and had Chris bring me every light fixture in the house so I could throw away the bugs and scrub away the dust. Maybe that should be on my list, too. 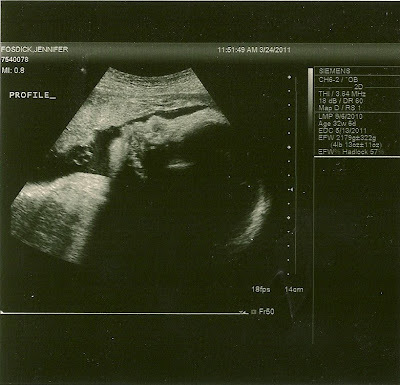 Here are some pictures of Baby Sister at 33 weeks (last week). She measured about a week big, and if I remember correctly, that happened with my other pregnancies, and by delivery time they measured a week small. The doctor said she is about 4 1/2 pounds. I can't wait to meet her! So far, we still haven't decided on what her name is. I like a lot of little girl names, but I just don't know which one is right! I am hoping that I will know the minute I look at her cute little face. Every day, I have a different favorite name. This week I have cycled through: Abbie Rae, Lexie, Gracie Margaret, and Margaret Hannah. Chris is kind of tired of my baby naming indecision, and is now saying "Yes, honey, that sounds great!" to everything I come up with. Who knows what we will end up with! Plus, I am still holding on to a sliver of hope that she could be blond, and that will definately affect what her name is, don't you think? 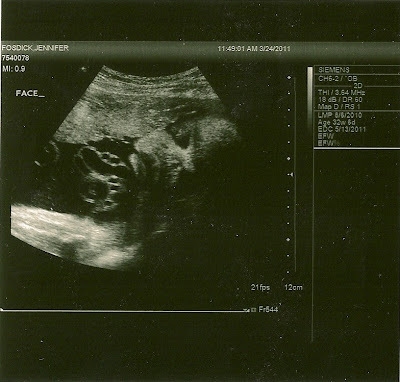 In the face picture, it looks like there are some bubbles under her chin, which I at first thought were hands, but they are the umbilical cord. Cool, huh? Check this out! We have these two gymnast kids and IKEA has these awesome play rings for $10!!!! Add 30 minutes of joist-finding and drilling, and we have two happy kids and the awesomest basement on the block! We are the happy custodians of Lola's Van while she is oversees and the time has come to re-register it. I have been dreading this moment, knowing how much it costs to get all the tests and pay all the fees, not to mention we need to replace the windshield in order to pass the safety test. (I am looking in to whether or not our insurance will cover it, but it doesn't look like it...) Well today I got a statement from the Washington State Department of Licensing with a summary of the charges to re-register the van in WA. Why does ten weeks seem so long right now? Meet my beautiful daughter, Leah. One of the most distinctive things about Leah is that she is insanely imaginative. She can make-believe out of anything. Balloons that have lost their float, a paperclip, a square of (clean) toilet paper, a clothes hanger, a 2 inch flooring sample. She will find a way to create an imaginary world around it. Her fingers are her friends, with constantly changing identities. As of today, they are elephant fairy butterflies; they play and sometimes even argue and hit. She also interacts with a TV show or movie, singing and dancing along with the characters, playing the storyline again by herself later. Today I whipped together a 30-minute fairy skirt out of some leftover fabric, truly homemade, but she thinks it is the greatest thing that has ever happened to her. And she is now playing "Fairies." Again. That girl doesn't need a whole lot to have a good time. Leah is really worried that she hasn't decided yet what she will be when she grows up. Some days she want to design buildings and build bridges. Other days she wants to be a dogcatcher. But every day she wants to go to the moon. One of her latest announcements is that when she grows up, she is going to have a teaching studio where she teaches people how to be superheroes and fairies (and even superhero-fairies). It will have a rainbow roof and a blue door. I am trying to convince her to charge more than $1 for her classes, because I think they sound great. She is constantly asking me when she can go on her first rescue mission to save people from bad things like fires, floods, falling out of trees, being captured, etc. Today she was shocked (like, jaw-dropped) to learn that sticks are made of wood and that wood and paper come from trees. And yesterday, the little girl who wants to protect the butterflies from the birds was equally shocked to learn that we eat cows and pigs and chickens every day. She'll ask us deep questions about what happens in a flood or an earthquake and we will start explaining how things work. Then she'll surprise us with a question like, "Where do the fairies go when their building collapses?" or "How will they fly away from the flood if their wings get wet?" I think she's smart enough that at some point in time she will filter out the imaginary from the real, so I'm going to keep giving her real answers. Leah is determined and loves learning. She is looking forward to swimming lessons this summer where she has decided she wants to swim without floaties. And now that she knows kindergarteners learn how to read, she asks me weekly how long it will be until she can go. (And she asked me what kind of garden they have, too). Leah is creative. She prefers artistic projects such as doodling, glueing, cutting, constructing fairy houses out of cardboard boxes, etc. When Samuel gets his hands on my iPod, he goes right for the games, but Leah goes for the doodling app and the letters flashcards. Leah is conscientious and helpful. When she wants to, she will help me clean or put away laundry, frantically scrubbing walls with a brush, sorting through the laundry as fast as her little arms will go, remarking "Look at how fast this is going!" She always wants to help bake or sew. She is a cheerful helper. She recently heard a dentist tell her story-time group that you should brush twice a day. Now every afternoon she concernedly observes "We forgot to brush our teeth this morning!" I simply tell her that we always forget in the mornings and run out of time. So this morning I made it a point to brush teeth as part of our getting dressed routine. As soon as she had rinsed and spit, she declared "Now we need to floss." Smart girl. Leah is also very silly--a characteristic she got from her silly parents. Leah is a good friend, always making new friends wherever we go, and never thinks about being shy unless someone reminds her to. And she is a great big sister. (Most of the time.) She is nurturing and wants to take care of the people around her. She is emotional and sensitive like girls always are, and is recognizing that it is hard work learning to control your emotions and deal with disappointments. Oh, there is so much to say about my little girl!